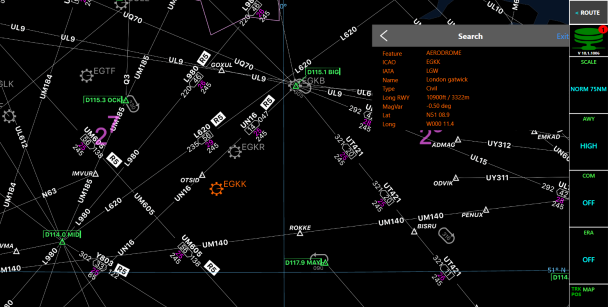 This will teach you how to search for aerodromes, waypoints, navaids, airways, holding areas and airspace. 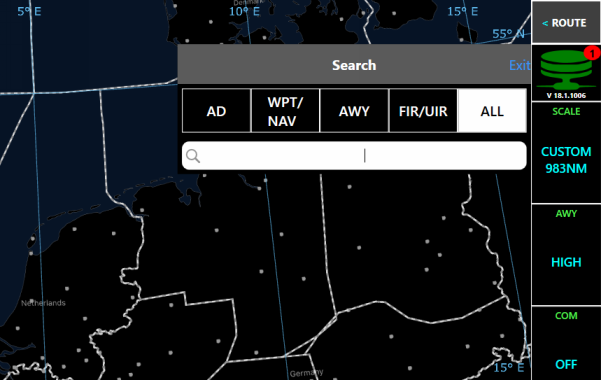 You can search within the Enroute map for features like Aerodromes (AD), Waypoints/Navaids (WPT/NAV), Airways (AWY), Holding Areas (HLDG), Special Use Airspace (SUA) and Flight Information Regions (FIR). 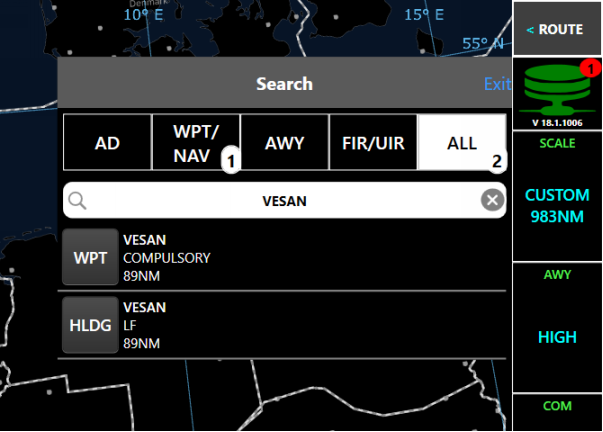 We shall now have a look how you can search for the waypoint VESAN. The search Icon and the search field, where you can enter a feature you wish to search for. Once the search icon has been clicked the search feature will pop up enabling you input your search feature. You can either select the data layer to search in: AD, WPT/NAV, AWY, FIR or ALL or choosing ALL will match the search criteria in all previously listed data layers as well as HLDG and SUA results. In this example you can leave the data layer to ALL. Enter vesan into the Search field. Search is only performed in the AWY level and related navigation features selected. Search results are returned based on all search criteria entered. If you are searching for AWY Q814, you will need to enter Q first. You will not see any results if you enter 814. You can see the results shown below the search field. Currently you can see two results available for the feature we searched. 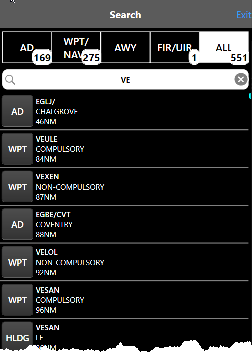 As you searched for VESAN waypoint then it will be the first one you will select. You can also tap the text beside the button to view more information on the feature. Search results are returned as you enter the second letter/number of your search criteria. The title bar lets you filter the results per feature. The number besides a feature shows you how many results are returned for each feature. In your example you can clearly see that we have one return for WPT/NAV and two for ALL. 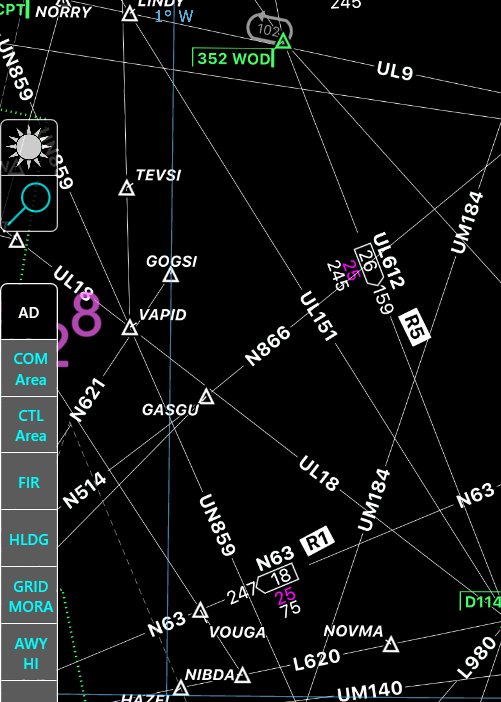 The map has now moved directly to the feature VESAN and information has also been provided on the feature. The feature and the information have both turned orange. Let's now search for an aerodrome using the same process. Enter EGKK into the Search field. 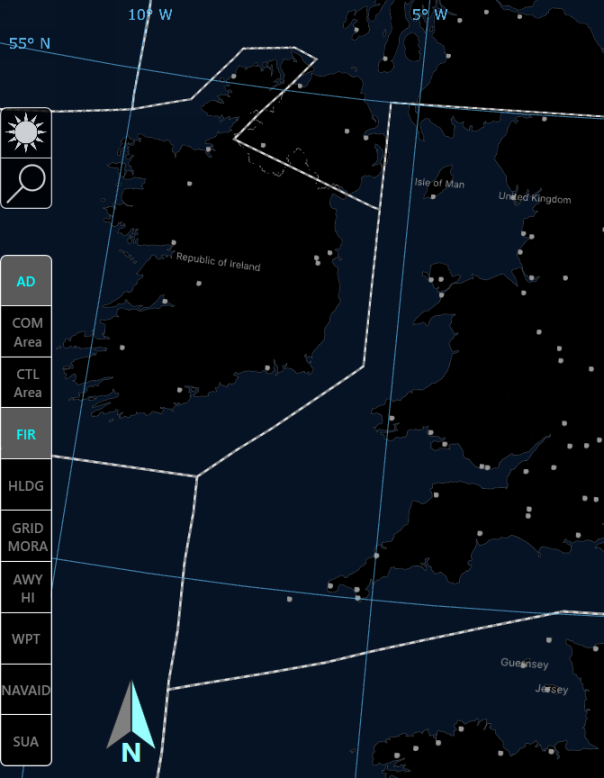 You can see that the map has centered and highlighted the information on the aerodrome but not highlighted or shown where the aerodrome is on the enroute map. The main reason for this will be due to the layer AD turned off on the layer toolbar. Let's turn the feature back on. Turning on the layer will bring the aerodrome back. You will not need to search again for the aerodrome.